Music by Robert Smith Jr.
Everything that can go wrong does on a young couple's terrifying vacation. Lost and unable to find an inn, they stop at the door of a mysterious house. They are told by the disfigured Togar that the Master does not like visitors, but with no other shelter in sight they decide to spend the night. Their presence ignites the fury of a Devil cult that preys upon their innocence. The family is forced to suffer interminable psychotic rituals. Unrest within the cult provides a chance for escape, but the Master will not free them so easily. Written, produced and directed by Hal Warren, it's less surprising that this is Warren's only picture and more astonishing that he was able to make it at all. Manos exists in a genre all its own, somehow combining the gravity of the silent horrors with the absurdity of a stag film. Widely regarded as one of the most inept movies ever made, Manos the Hands of Fate is a thoroughly puzzling story loaded with surreal characterizations and a gratuitous surprise ending. A family gets way more than they bargained for when they stop at a scary house to ask directions. Namely, the man of the house keeps a harem in the basement and communes with the Devil. Best known for its hilarious treatment on "Mystery Science Theater 3000." Hal Warren (the director of Manos) was a genius. It's sad that he didn't get a chance to make more films. This movie, while often called one of the worst movies of all time, simply is not. In fact, if one watches forgeting the stigma, it can really be enjoyed; from the creepiness of Torgo, to the splendor of the twist ending, this movie easily makes out with a passing grade for the $5.95 price tag. Awesome buy! Nobody could do the vast amount of work required to produce a feature film with Casting, Location Scouting, Costumes, Shooting, Editing, Music and the 100% Voice Over work that Harold did... and still have the film come out the way it did, UNLESS it was intentional! I mean, come on! Some of the lines in the film are repeated by the actors twice in the same scene! It's not like Harold couldn't catch those mistakes when editing. It would have taken hours of work, watching the film over and over! A quick snip of the old 16mm film, and the problem's solved! But NO! All the troubles and mistakes that make the film great are in there for a reason! MANOS is one of my favorite movies of all time. I've made a few films that sell pretty well, and I'd LOVE to remake this one! Certainly NOT to take anything away from the original, but to pay it homage! Besides, if Quentin Tarantino likes MANOS, then it's good enough for me! What can I say about this that has not already been said? Did you know Hal Warren made this movie on a bet? You did? Oh well. This movie has been blasted, not entirely undeservedly so, on "Mystery Science Theatre 3000" but that at least kept it from becoming a forgotten film. Try watching it without the distractions of Joel and the Robots and you'll notice some interesting points. The entire movie was filmed with 1 camera, a hand held 35mm job that only held 32 seconds of film. Watch the movie with a stopwatch (I dare you!) and you will see that no single scene runs over that length. That is why there are numerous disolves to the same shot. Also take a good look at Torgo. MST3K had to crop the film so you cannot see that bottom of the screen. Seeing the full view you will notice 1 or 2 scenes where Torgo clearly has cloven hooves instead of feet. That's why he walks that way, he is a Satyr! We all know it isn't art, but it is a classic in its own twisted way. One darkly ironic trivia note, John Reynolds (Torgo) and Diane Mahree (Margaret) both committed suicide just a few months after working on this film. I am a person who can sit through the worst of B movies and not even realize they're bad. Despite this, Manos stirred something deep within me. I think it was last nights zuchinni chili suprise. I understand this movie is low-budget, and that it has a loyal cult following. So did Jim Jones. Even with Joel and the Bots of MST3K, this movie is barely even watchable, and I sincerely believe that were I to view it in its original and uncut form, my eyes would bleed and my mind would descend to the ninth layer of hell itself. 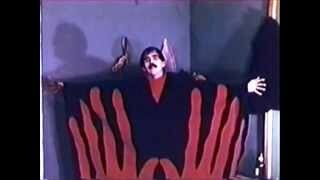 Nothing can hope to redeem "Manos: The Hands of Fate"
I saw "Manos" on MST3K like a lot of people, and I have to say that dispite it's short comings it had its charm. It's an unforgetable film, and it's crazy characters are memorable. Hal accomplished a dream with "Manos", he proved that even a fertilizer salesman from El Paso can make a film that's popular, and it doesn't take a big budget, good actors, or excellent filmography. Myself being one who loves indepentant films, salute the late Hal Warren on the creation of this film. He was the Lloyd Kaufman of his time. Hal Warren was my dad, and he'd be as surprised to learn that his movie has made it to DVD as I am. He was the first to admit that this movie was along the lines of a BAD grade B movie. But his intent was to make it a FUN thing. He knew it would never be the best movie out there being as he made the movie on a small budget and with his friends. His Family loves the fact that Manos has made it as big as it has, and I only wish he was alive to see the following it has received.